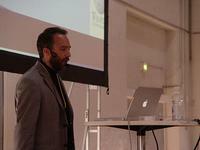 The Reboot conference in Denmark was very enjoyable. Nice to be in my home country for a couple of days, and lots of great speakers and contacts. I'm by now used to that a techie conference like that is very wired, but it is still something that would probably be weird to many people. 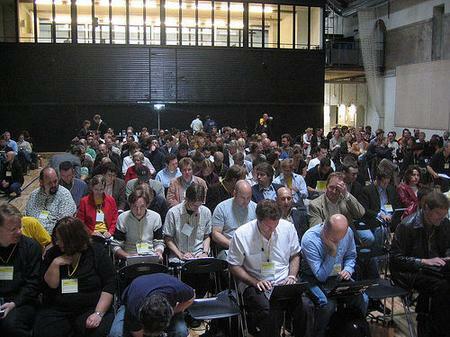 When somebody's speaking, about half the audience is sitting typing on their laptops. They check any websites mentioned, they make collaborative notes, they chat on IRC, they post to their blogs, they coordinate where to go for dinner, or they do whatever they feel like. The result is that there are more dimensions to whatever is going on, and that you probably are more informed, and information is more cross-indexed for you. Through the magic of tags, you can see most of the blog postings from participants on the Technorati reboot page. It doesn't work great for me personally to make blog postings in real-time, but it is cool that it works for lots of other people. Before a speech even is over, you'll see the first blog postings, and you'll see the pictures people have posted to Flickr. Right this second, there are 1035 photos posted to Flickr on Reboot, and 91 blog postings found by Technorati. Inspired keynotes by Doc Searls and David Weinberger, two of the authors of Cluetrain Manifesto. Weinberger was on fire, as somebody said. Doc is always entertaining. Keynote by Cory Doctorow. In addition to being a science fiction author and editor of BoingBoing, Cory is a big champion for EFF. He talked about some of the latest battles, like the Broadcast Flag. He is very skilled at boiling the issues down to the essential hardhitting facts. There are companies and government agencies in the pocket of Hollywood media companies that work very hard on delivering LESS to you, for MORE money. "Sorry, we've revoked your right to record that TV program". Negotiating Language and Meaning with Social Tagging. Lee is brilliant and provides great examples of how to use some of this cool technology in real and practical settings. Like for effective community websites for non-profit and government institutions. His recipees are very worth examining. Ben Hammersley is crazy and entertaining. His talk, 300 Years of Blogging, Etiquette and the Singularity, presented the idea that blogging has parallels to the phenomenon of papers with comments on issues of the day that were handed out and discussed in coffee houses in England 300 years ago. And he made some intriguing comments on how rudeness and embarrassment might be bigger issues than technology on the net for most people. You know, for his grandmother, the issue of adware on her computer putting stuff up she doesn't want is just so damned rude. It isn't an issue of what flaws IE might have, it is just rude behavior. And how some people might be very conscious of what other people might think, and therefore hold themselves back from doing stuff they technically could do easily. Like his wife who wanted to participate in a certain game, but was afraid to, because she didn't want to be seen doing something wrong, or accidentally messing something up for somebody. Jimbo Wales, the founder of Wikipedia, talked about ... Wikipedia. An interesting angle is that he doesn't at all consider it this emergent swarm phenomenon. It isn't just a chaotic buzz of little ants that do different things, and that somehow a useful encyclopedia emerges from that. On the contrary, it is quite hierarchical. Yes, anybody can in princple go and, anonymously, write and change anything they like. But, really, that's mainly for PR. Most things get written or edited by a rather small percentage of known users. It is a community. A community where people have taken on particular roles, based on their track record, reputation, and how well trusted they are. Most things get worked out by real people talking them over, not by any automated voting system or anything. Some people have more say than others, because they've earned it. Saturday night was a showing of the famous 1968 Doug Engelbart demo. 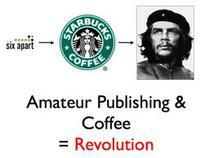 "The mother of all demos". A bunch of smart people at the Stanford Research Institute in Menlo Park showed how they imagined computers should work in the future. At a time when computers mainly were big mainframes that did nothing of the sort. They invented the mouse, and one could click and drag (sort of) on the screen, and draw lines directly on the screen. And one could collaborate on a document, with video conferencing, and create outlines of information, etc. It was both amazing for the amount of foresight those guys had, and for a look into how terribly difficult it was. They could just sort of barely hold the system together for the demo, with six people and a whole lot of the most expensive hardware they could get their hands on. Doing things we nowadays take for granted, but which only got to happen because pioneers like them MADE it happen, against the odds. 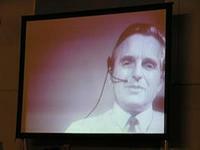 Doug Engelbart himself introduced the video over an iChat video link, and participated in a Q&A afterwards. Which I didn't stay for, because it was getting really late. Lots more, but you can find plenty of commentary in the other sources. What a fantastic experience - after the fact, via you, and then into the links of the who's who were there. That's the way a conference should be - as much stimulation as conceivably possible - links, multi-levels of info, and superb experts. Looks as crazy as the Stock Exchange on a panicky day!!! Yeah, quite a wild scene. And, yes, this is cool in that it gives more ways of being present. You can be there to a large degree, even if you stay home. You can see the notes, be part of the conversation, and, I'm at sure, at some point see the live video feed. Nothing technically difficult about that part, it just hasn't become de rigeur yet.